Tom Lawance aka The Falcon (Tom Conway) meets an attractive young lady (rita Corday) at the races. She asks for his help as she is suspected of stealing some peaarls from her employer and is being followed by an insurance investigator. When people start getting murdered, The Falcon is the suspect and has to work with Rta Corday and his side kick Vince Branett to solve the case which seems to involved an attractive night club singer (Jane Greer). 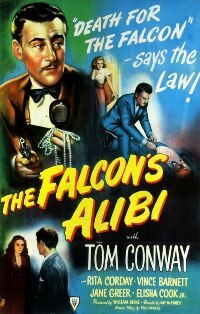 This is one of a series of second features staring Tom Conway as the asitocratic private investigator, The Falcon. This is one of the better films in the series with Tom Conway well supported by Rita Corday and Jane Greer.